Right Angle VGA to VGA Cable Adapter Type 2 - M/FThe Right Angle VGA to VGA Cable Adapter from Startech.com® is a Type 2 connector that provides one right angled VGA male connector and one standard VGA female connector. This adapter is specially designed by Startech.com to overcome space problems. The right angle incorporated in the VGA to VGA Cable Adapter allows you to connect the cable to a VGA Female port, even if space around the VGA port is limited. 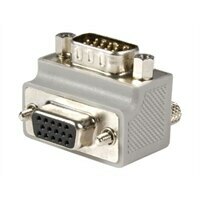 The Right Angle VGA to VGA Cable Adapter from Startech.com® is a Type 2 connector that provides one right angled VGA male connector and one standard VGA female connector. This adapter is specially designed by Startech.com to overcome space problems. The right angle incorporated in the VGA to VGA Cable Adapter allows you to connect the cable to a VGA Female port, even if space around the VGA port is limited.